Faro is the southernmost city in mainland Portugal. In summer, it is a popular destination for vacationmakers from all over the world, mainly due to the presence of an international airport. It also enjoys a reputation as more tourist-friendly than many other parts of the region. After summer, most tourists will have left, but Faro is still a good starting point to explore the more remote areas of the Algarve. The hustle and bustle of the summer turns into the charming Portuguese winter. Faro and its surroundings are perfect to discover with a car rental. Renting a car will be easier for you thanks to Driveboo, where you can compare offers of many rental car companies online and book the one that best suits your needs. Are you coming by airplane? Rent your car for Faro at the airport! Faro Airport (FAO) is an international commercial airport operated by ANA Aeroportos de Portugal. It is the third largest commercial airport in the country, after the Lisbon and Porto airports, and serves as a gateway to the whole region of Algarve. The airport is located just 6 km outside of the city. There is a large selection of car rental companies offering rental cars right at the airport. These companies are located mainly in the area: "Parking P4 - Car Hire." Driving a rental car in Faro - what should I know beforehand? Portugal is one of the most popular European destinations for summer road trips. Just as in neighboring Spain, be prepared for some chaotic drivers on the roads. The driving style of the Portuguese can be, as in many southern countries, quite "hot-blooded." Above all, it is advisable to know the most important traffic rules in Portugal. For example, the alcohol limit in Portugal is 0.5 and the mandatory inventory in a rental car includes a safety vest. However, if the car is registered in Spain, then a warning triangle, first aid kit and fire extinguisher must also be carried. In addition, between 1 November and 15 April, all vehicles must be fitted with winter tires with a tread depth of at least 4 mm, as well as with snow chains, if actual winter conditions prevail. As in many other European countries, you must pay a toll for driving your rental car on highways. Since 2011, an electronic payment system is in place. We recommend you ask for information at the pick up station. Find out whether your car rental is equipped with an electronic transmitter or not. There are four systems in place your car rental could be equipped with. The Easy Toll, Toll Service, Toll Card, and Via Verde Visitor. However, if you are traveling with a rental car in Portugal, you usually do not have to deal with this. Most major car rental companies equip their fleet with electronic transmitters. The cost of the device and the toll will be charged to your car provider. You simply pay the fees when you return the car. If such a transmitter is installed, you can also drive your rental car on the Via Verde lanes. If not, you will need to pay the toll yourself and choose one of the options listed above. Full insurance without non-waivable excess will always be the best choice when booking a rental car. When comparing the offers, make sure to look for it and narrow down your search. If you have a rental car in Faro and you want to enjoy the beautiful old town, you should definitely park somewhere in the city center and stroll through its streets. The baroque buildings are worth seeing, as are the small restaurants and cafes. If you are on holiday in the Algarve, you will need a good appetite. As a rule, up to seven courses can be served here. Delicious, fresh and tasty. 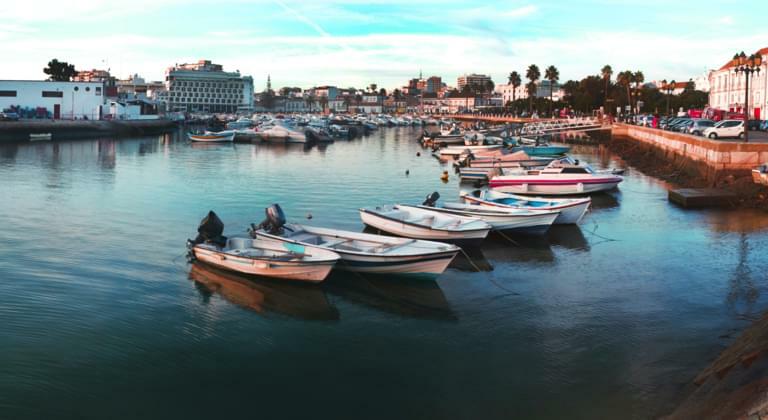 Not far from the busy city center, you will find the port of Faro, where you can go with your rental car. However, you have to remember that within the city you will be able to use the rental car only for quite short distances. The harbor is definitely worth a visit. In addition to old fishing boats, you will also see many smaller yachts, surrounded by turquoise water. It is amazing to have a rental car during a holiday in Portugal. Faro will be a great starting point for you to discover the region of Algarve. After a relaxing time at the wonderful beaches, reading good books and watching the surfers, take the opportunity to discover the beautiful area around Faro. Take your rental car and drive to wherever your heart may take you. Explore the beauty of the region. It takes just an hour to get to the coastal town of Lagos from Faro. Experience the history of the once proud seafaring nation up close and follow the footsteps of great explorers. The old town is often described as magical. Of course, you can park your rental car in one of the many parking lots and explore the city on foot. Museums, exhibitions and the city walls are just some of the sights. Not far away is the famous Castle of Silves, which will definitely be worth a visit. It is located just outside the gates of the historic city center. A fortress, which serves as a witness to the rule of the Moors, will take you back to a bygone era. Portugal really holds up to its reputation of being a surfer paradise. For those who love surfing, you won't be disappointed. Along the numerous beaches you will find many popular and famous surfing hot spots. Between Faro and Lagos alone, are numerous surfing beaches. Beaches worth visiting are Arrifana, Amado, Castelejo, Tonel, and Zavial. You can rent a car from the car rental company that will be able to transport your surfing gear safely through Portugal. For such a requirement, it is best to carefully compare the offers of all the car rentals in the city!